On this tab you can configure the Auto-Downloader feature of EurekaLog Viewer. This tab is not enabled if you've set Viewer to view mode. You can enable any type of auto-downloader (POP3, IMAP or file) or even few of them, set their settings and EurekaLog Viewer will automatically download and import bug-reports from these sources at every run. Warning: note that EurekaLog Viewer ERASES any e-mail or bug report after successful import. Be sure that you do not have any other information in these sources except for bug-reports. 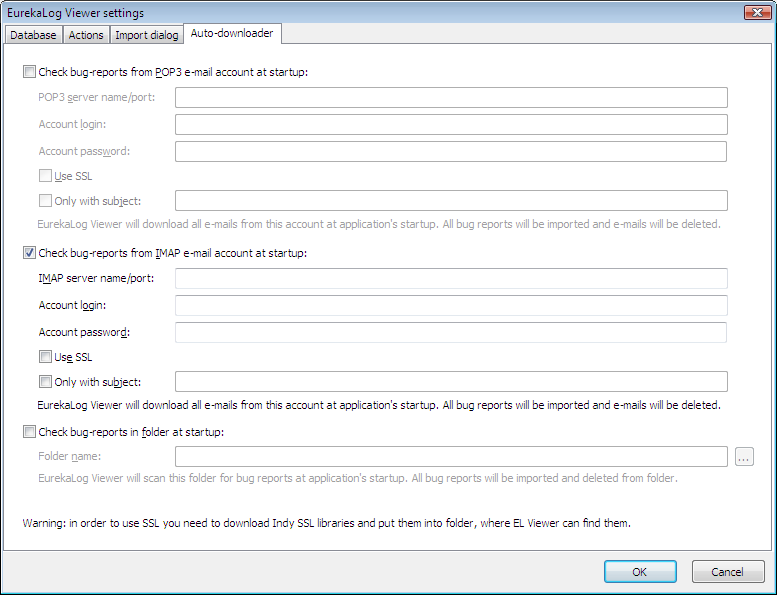 For e-mail accounts it means establishing a special account, that you'll use only for receiving bug reports.